Ground-plane measurements are setup by placing the loudspeaker on a hard flat surface, such as a cement or asphalt parking lot, with the microphone placed on the ground (fig. 1). The measurement being made includes the sonic mirror image of the speaker, which is why the microphone is placed on the ground at the apex of the direct signal and its reflected sound image. Ground-plane measurements should be made in open air, and the nearest boundary should be at least 10 meter from the loudspeaker. Making full range measurements by ground-plane is relatively easy. For better results with floor standing type speakers, the speaker should be tilted forward. The response measurement made with the ground-plane method give results similar to those obtained by anechoic measurements. The key to explaning the differences between the three domains is in understanding the nature of the 'step' response. When sound radiates from a driver cone which has no boundery or baffle, the radiation is hemisperical up to the frequency when driver directivity starts to narrow. If the driver is mounted on a baffle the baffle acts as a reflector, increasing the amount of energy in a given direction. The 'step' occurs when the baffle starts to act as a sound reflector. When the baffle is made infinitely large, the 'step' occurs at all frequencies, hence the flat response shape in fig. 2. The increase causes a doubling over of the sound pressure, or 6dB of gain over the free field measurement. When the radiating surface is limited to only the enclosure baffle (anechoic and ground-plane measurements), the 'step' occurs at whatever frequency is determined by the area of the baffle, as the response transforms from 4pi to 2pi. The response 'step' begins on the anechoic measurement at round 75 Hz ( see fig. 2 ) and levels out two octaves above at about 300 Hz, rising at 3dB/octave. 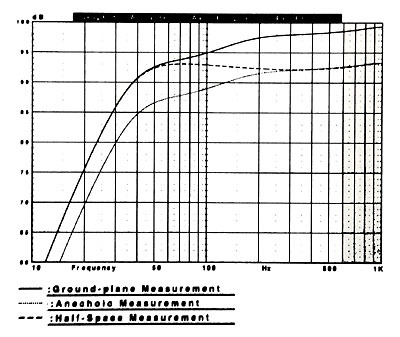 The ground-plane measurement includes two sound sources , the direct sound from the speaker and its image, so the total gain compared to the anechoic measurement is 6dB. This is why the microphone is shown at 2 meters in fig. 1, since doubling the microphone distance will decrease the overall sound pressure by 6dB, and make the pressure level recorded equivalent to that of an anechoic measurement at 1 meter. Windowing (gated) Measurement taken and unwanted data windowed out Fast data acquisition & post-processing Requires significant data post-processing and the ability to skillfully interpret the results LF measurement accuracy defined by environmentally determined window length. Poor tolerance for time variance. Near Field Measurement Measurement done with microphone placed near to, centered on and normal to front emissive surface of each acoustic radiator When implemented correctly, the near-field amplitude response provides for an accurate facsimile of the far field response Multiple emissive surfaces require multiple measurements along with subsequent post processing Upper frequency limit determined by size of DUT. Click here to read about Far - Field Masurement or Near - Field Measurements .